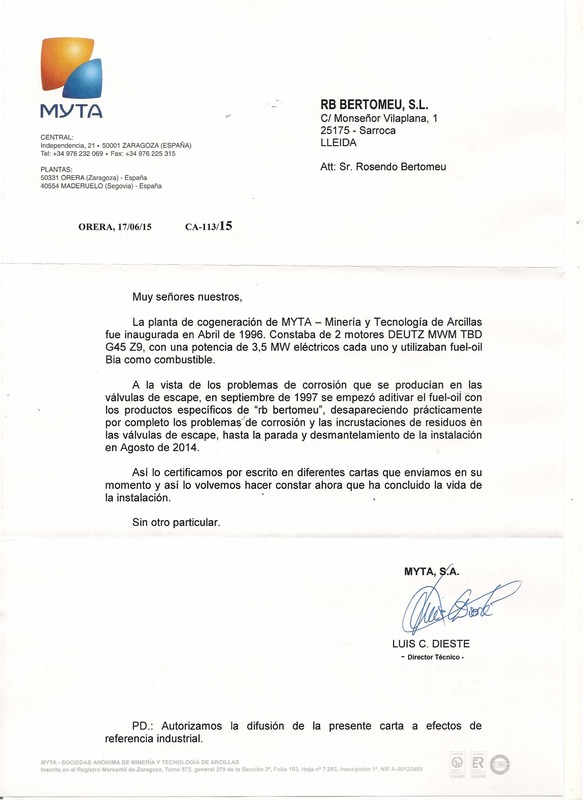 The MYTA - Mineria y Tecnologia de Arcillas power plant was inaugurated in April 1996. It had 2 Deutz MWM TBD G45 Z9 engines, which delivered 3.5 MWhe each one and used fuel oil Bia as fuel. Corrosion problems in the exhaust valves were detected and in September 1997 we started to additivate the fuel oil with the produts that "rb bertomeu" provided us with, almost completely disappairing the corrosion problems and sludge incrustation in the exhaust valves, until Agost 2014, when the plant was dismantled. In the past, we certificated theese facts in several letters and we do it again, now that the plant's life has ended. PD: We authorise the exhibition of this letter as industrial reference. In reply to your request we certify trhough the present letter, that since several years ago we are using the fuel oil additive “rb bertomeu” beco F2/A , manufactured and supplied by your company. The obtained results , technical and economical, are satisfactory in our factory of Maderuelo (Segovia). In that factory we use fuel oil nº 1 as fuel , treated with the above mentioned product beco F2/A. Equipped with a burner Pillard type of 5000 T/h . We authorise the circulation of this letter as a reference for any purpose. A - Our cogeneration plant is equipped with 2 DEUTZ MWM engines, type TBD 645 L9, with a power of 3,5 Mwe each one. The engines were put in operation in April - 96 and are using fuel oil nº 1 BIA as fuel. B - After some adjustments in the operation of the installation carried out between the implementation and the June ’97 inspection, we decided to prevent the corrosion problem of the exhaust valves of the present engines from the beginning of operation. To this end, knowing the results obtained in the cogeneration plant of MSM, belonging to our Business Group SAMCA, we decided to contract the services of rb bertomeu S.L. C - Since we began the additive treatment in September - 97 of fuel - oil Nº BIA “rb bertomeu” products beco Mg and later “rb bertomeu” beco F1/ASF, practically all the corrosion problems previously cited have disappeared, which has produced a great saving in maintenance and repair time. Also we note the disappearance of the serious residual encrustation that was produced in the exhaust valves as well as in elements of the exhaust gas circuit. D - Finally, we appreciate the technical collaboration that we have received, through assistance in engine inspections, analysis of combustion gases, compilation of follow-up information, etc., all immensely useful for our plant management.